Work & Study without Fatigue! A healthy posture is essential for those who spend most of the day staring at a computer. The ergonomic monitor stand from SONGMICS is designed to create a healthy, comfortable and efficient work environment. With this stand, you will alleviate neck and back strains. 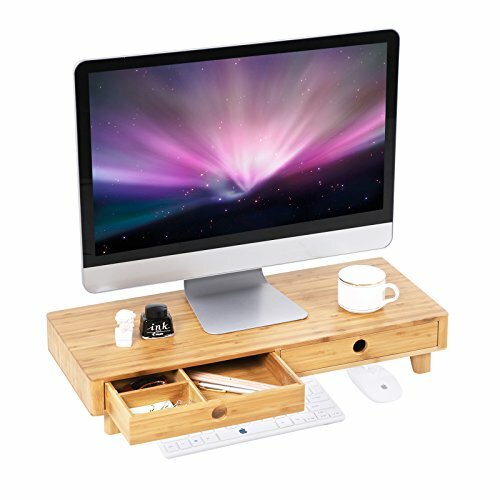 Exquisite workmanship at every edge and corner; space under the surface keeps various office supplies like mouse and keyboard in their rightful places; desktop is specially designed for phones and tablets; 2 drawers, one of which has separated compartments inside, are perfect for all kinds of small items. As a natural, renewable, fast-growing material, bamboo is the perfect substitute for solid wood. It also plays an important part in our fight against deforestation. Get yours today and add to your office or home study a fresh and stylish touch!